There are many benefits of incorporating a dry lot(s) into your environmentally-friendly equine facility. A properly designed dry lot provides an attractive alternative to stalls as an area where horses can be turned out as a herd to help manage and protect pastures. Below are key tips on proper dry lot design. Size – A general rule of thumb is 400 to 500 square feet per horse. Grading – Similar to an arena, a dry lot should be graded with a 1 to 4 % slope. A completely flat area will not drain water, whereas a slope greater than 4% will be difficult to maintain footing and not provide a flat enough surface for horses to stand for long periods. Storm water runoff management – Diverting storm water away from the dry lot is critical. The best strategy is to locate the dry lot on high, dry ground; however, this is not always feasible. When grading the dry lot, it is strongly advised to also grade a grassed swale or install a french drain system along any areas uphill of the dry lot to capture and redirect surface water runoff. You will be glad you invested in this feature the first time you get a heavy rain. Footing – Proper footing is another critical factor. Good footing design starts with a properly graded and compacted sub base. A base layer 3 to 6 inches deep of crushed rock -- either screenings or 1.25” minus crushed rock -- works well. The base should also be compacted, either by machine or by allowing the material to settle for several months. When budgeting for a dry lot with improved footing, it is strongly recommended to not cut corners on the sub-base and base work, as they are critical to long term performance and costly to repair in the future. It is recommended to err on a smaller dry lot that you can afford to design correctly versus a larger dry lot if that means cutting corners on design. The top footing, on the other hand, is an area where you can start economically. 1.5 to 2” of sand or screenings is a good place to start. After a short while, you will get real world feedback on the performance of your footing to guide you in amending the footing to improve desired performance. Is it too hard, too dusty, to slippery? With top footing, it’s much easier to add to than remove and replace. Finally, when selecting footing, ask the quarry for a gradation report, which is a summary of the particle size distribution of the sand or crushed rock footing. This will provide you with important information as to the likely performance of the footing. Gradation reports can be difficult to interpret, so you may want to reach out to your local Ag Extension agent or equine facility design expert for assistance. Clean water is a resource that is required of all living things, including humans and horses alike. With increased land use -- everything from urban development to the increasing number of small acreage horse farms near the urban/rural interface -- there is potential for increased water pollution. While there are many sources of water pollution, one commonly associated with horse properties is the use of fertilizer, which contains high levels of nitrogen and phosphorus. Increased levels of these two elements can result in a range of environmental effects, including algal blooms that can cause fish kills, and in extreme causes can make our drinking water toxic. Horse manure is another potential source of these nutrients. Additionally, manure can contain harmful bacteria and parasites that can negatively impact water quality. It can be tempting to say, “It’s not just my horses doing this, what about all the wildlife that deposits waste in streams and water ways?” Indeed, there are many pollutant inputs from a range of sources, including wildlife inputs. However, these two scenarios are not completely comparable. In a natural setting, many different species are moving across the landscape, unconfined and unhindered. This results in waste being deposited across a large area, on the order of square miles, with a greater amount of land available to utilize and process this waste. Livestock farming is typically the opposite, with one or two species in large numbers being confined to the same area of land. For example, a horse will produce an average of 35 to 50 pounds of manure a day, whereas a deer only produces 1.7 pounds. This means that a single horse produces the equivalent amount of manure as roughly 25 deer. The larger the horse herd, the larger the waste input, A herd of 10 horses, for example, is the equivalent to having 250 deer confined to an area of land much smaller than deer would normally use. Hence, land used for livestock is under constant pressure to utilize the waste inputs of a much larger population of animals, and this results in the potential for water to be overwhelmed with these pollutants. This impact can be even greater if a single stream is the only water source in a pasture. The horses will spend a greater amount of time near the water, resulting in erosion and sediment pollution entering the water, in addition to any waste the animals deposit while spending more time in the area. The good news is that there are natural methods of reducing water pollution from our horse farms. One of the most effective of these methods is the use of well-designed and maintained riparian buffers. Riparian buffers, defined generally, are vegetated areas near waterways that protect water quality while providing bank stabilization and habitat for aquatic and terrestrial species. These riparian buffers work in several different ways to reduce pollutant runoff. The vegetation in a riparian buffer works to first slow down the flow of surface water. This gives time for any sediment and other particles to settle out of the flowing water before they reach the stream. Additionally, the plants utilize the nutrients and water for their own growth, absorbing nitrogen and phosphorus before they enter water sources, instead becoming a part of the plant. Soil bacteria are another incredibly important component to riparian buffers. Certain soil bacteria utilize nitrogen as their energy source, transforming it into an inert nitrogen gas that leaves the soil for the atmosphere, thereby leaving the water. Once planted, riparian buffers need little maintenance—you simply let nature take its course. What factors impact the effectiveness of a riparian buffer? How wide should the riparian buffer be? What plants should be used in the riparian buffer? Does my county or state have any laws pertaining to riparian buffers? The overall effectiveness of a riparian buffer is tied to hydrology, or how water moves across the landscape. Riparian buffers should be located adjacent to any surface waters where they can intercept water flowing off of pastures or manure piles. The flow of water must be slowed enough to allow sediments to settle out. and prevent channels from being formed. Channels will effectively act as pipes that let the water pass through the buffer without being treated, so steps must be taken to prevent their formation. Be aware that most nitrogen reaches surface waters from water that has infiltrated the soil. become groundwater, and then enters streams. Hence, the plants used in a riparian buffer must have deep roots to utilize nitrogen below the ground. Steeper slopes that speed up water flow. Less permeable soils that prevent water from infiltrating and becoming available to plants and bacteria. The larger the animal population, the wider the buffer should be. Areas with higher erosion rates. In a comprehensive review of riparian buffer studies, some general guidelines on width have been established and can be used to help plan a riparian buffer on your horse property. The most common suggestion is the use of a 3-zone buffer system, with specific plants and minimum widths. Zone 1, closest to the stream, should be undisturbed native trees to help stabilize the lake or stream bank, and it should ideally be at least 15 feet wide. Trees have the benefit of a deep root system, which bring carbon down to bacteria, stimulating the bacteria that will be necessary to remove nitrogen. Trees also provide long-term storage of nitrogen, since trees have longer lifespans than grasses. Zone 2, should be a combination of native trees and shrubs, which can be harvested occasionally to remove nitrogen, and should be the widest of the three zones. Zone 3 should be grass, at least 20 feet wide, to filter and slow water. Ideally, this grass zone should be fenced out of the pastures. On many small-acreage horse farms, a large buffer area might not be feasible, However, just because a buffer might be smaller does not mean it is ineffective. Indeed, a balance must be found between the amount of property available for the horses and for the buffer, the number of horses on the property, the landscape (slope, ecosystem, closeness to water), and costs of implementing a buffer. When selecting plants to include in a riparian buffer, choose species that 1) are native to the area to prevent the introduction of invasive species, 2) are not toxic to horses, and 3) are not nitrogen-fixing species, such as clover. Nitrogen-fixing plants have bacteria in their roots that provide nitrogen to the plant, so they are less likely to remove nitrogen from the environment. While horses can be an enjoyable part of the landscape, it is important to realize and account for the impacts that they have on that landscape. With water quality impaired in many places across the U.S., reducing the impact of one’s animals can assist in making waters cleaner on both your property and to downstream users and aquatic habitats. Riparian buffers provide a natural, effective solution to the question of horse-related nutrient pollution, and with a little planning, they can be implemented on many properties as a cost-effective best management practice. Where to find more help? Your local Natural Resource Conservation Service office or Soil Conservation District office can help with riparian buffer guidelines and practical advice specific to your area, and can help determine if your farm is eligible for grant funds to help offset the costs of riparian buffer restoration. They can also assist you, should your particular state have any laws regarding riparian buffers that need to be met, as such laws are becoming more prevalent across the U.S.
With proper planning and management, trees can provide numerous benefits to our horse properties. Shade - One obvious benefit of trees is, of course, shade. Just as we humans enjoy shade on a hot day, horses too benefit from this natural, living shelter. Man-made structures such as barns or run-ins can certainly provide shade; however, as prey animals that evolved to see predatory threats in large, open spaces from great distances, horses will often prefer the open shade of trees. Existing trees also provide the benefit over man-made structures of incurring little to no added cost to the farm owner. While trees can provide excellent shade, this ability is reliant on the age and size of the available trees. A field that provides access to smaller saplings is not a good choice, as horses may be more likely to damage saplings than use them for what little shade they provide. Hence, planting young trees in the hopes of providing shade might not be feasible, as certain tree species only reach maturity at 25, 50, or 75 years of age. If one decides to plant young trees, care must be taken to ensure they are not destroyed by the horses or by natural events. Fencing off the young trees within the pasture, or planting them outside the pasture along the fence line will help protect the trees as they grow. Additionally, it is important to select native species that grow quickly to receive maximum benefit. Another benefit of shade from trees is lower sugar content in pasture grass. One review paper shows that grasses grown in shade have lower sugar content than those grown in full sun, which can reduce the risk of a horse developing laminitis. This benefit can be utilized by planning some pasture areas located adjacent to an existing stand of trees. Be aware that if given the option, horses may selectively graze un-shaded areas, as horses have shown preference for higher sugar content grasses. However, just as a child may prefer to eat a hot fudge sundae to brussels sprouts, a horse’s grazing preference is not an indicator of better nutritional health. As such, use cross fencing to confine grazing access within these “shaded” areas, and incorporate them into an overall rotational grazing strategy that includes other pastures that receive full sun. The lower sugar content of shaded pastures can also provide a better turnout option for horses with insulin resistance than pastures that receive full sun. Ultimately, you should consult with your veterinarian regarding a proper turnout protocol for a horse with insulin resistance or one that is prone to laminitis. Environmental benefits - Beyond shade, trees can provide other benefits on your horse farm. Trees play an important role in protecting water quality, especially when incorporated into a riparian buffer strip. A riparian buffer allows for any water runoff from pastures to be naturally processed and filtered, removing excess nutrients—an important consideration given the volume of manure that horses can create as well as the need to periodically fertilize pastures. It is critical that horses be fenced completely out of these buffer strips, but with proper planning they can double as a shade source in pasture areas along fence lines. Your local Soil and Water Conservation District or local Natural Resource Conservation Service agency can provide help and resources when planning riparian buffers and the trees they should contain. Additionally, trees provide important habitat features to a range of wildlife, but particularly birds and bats. These creatures rely on trees for their habitats, but can also benefit from the manure that horses leave behind. These droppings can contain parasites and provide a breeding ground for flies and other insects, providing a food source to the birds and bats, which in turn help reduce the insect populations in a field. Reading the above, it can seem that trees provide an ideal natural resource for a horse pasture. However, for all the benefits above, the wrong type of trees – or inadequate management practices -- can present risk to the horses that live amongst them. As such, important factors must be addressed prior to planning a new pasture or paddock, or when managing an existing one. Toxicity - The first and most immediate concern with trees is toxicity. While the majority of trees are generally safe for horses and from horses, a single toxic tree can have extensive, costly, and sometimes deadly impact on a horse. Below is a list of common toxic trees, with links provided to detail the trees for identification purposes. - Yew (Taxus sp.). There are several species of yew. Some are native and some were introduced as ornamental species due to the bright evergreen leaves and red berry-like structures that ripen in fall. All parts of the plant are highly toxic. - Oleander (Nerium oleander). Technically a shrub, but a common introduced ornamental that is highly toxic and worthy of noting due to extensive planting. - Red Maple (Acer rubrum). A common maple, turning brilliant red in fall. Often planted, but grows wild as a mid and understory tree. - Black Cherry/Plum/Peach (Prunus spp.). Cherry trees, plum trees, and peach trees all contain cyanide compounds, a deadly toxin. Both native and introduced species are widespread. - Black Walnut (Juglans nigra). A large growing tree, often associated with wetlands. Produces fragrant nuts that are good for humans to eat, but all parts of the tree are toxic to horses. - Black Locust (Robinia pseudoacacia). A mid to large tree, often growing in recently cleared areas, that is covered in sharp thorns and produces white flowers in spring. 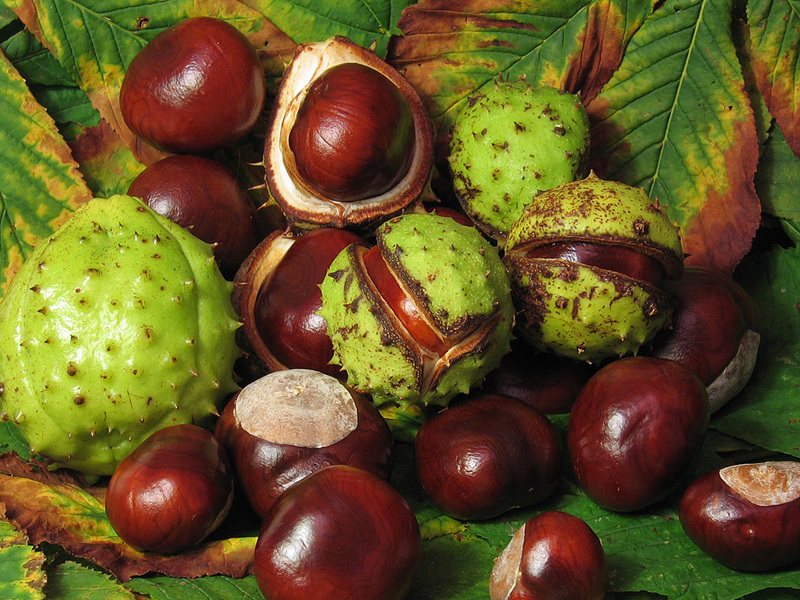 - Horse Chestnut (Aesculus hippocastanum). A large introduced tree, producing glossy brown nuts that emerge from spiky green seed capsules. - Acorns/Oaks (Quercus spp.). Oaks vary widely in average size, leaf shape, and range of growth. Of primary concern are the acorns, leaves, and buds, which are toxic to horses. - Russian Olive (Elaeagnus angustifolia). A highly invasive, non-native species, introduced for ornamental purposes, due to its silvery-green leaves and fragrant flowers. This list is by no means exhaustive, but serves to highlight common trees that present a threat. Several sites include full lists of toxic trees -- and plants (TheHorse.com, ASPCA, NCSU). Any toxic trees should be removed from pastures or any other area where a horse can have unsupervised access. Tree removal services can provide help in determining the safest, most effective way to remove any toxic trees from an existing pasture, and proper planning of a new facility can work to avoid existing stands of toxic trees and to ensure that any planted species are safe. Additionally, some of these trees are valuable commercially for timber or ornamentals, so well grown specimens might be able to be harvested for other uses, which a local forester can assist with. Aside from the risk of ingesting toxic tree material, there are also concerns with the overall health of the trees in a pasture. Trees should be monitored for signs of rot and weakened areas, which might result in a branch falling in even a gentle breeze or mild storm. Old trees and/or branches should be removed to ensure that they do not present a falling hazard. Girdling - Horses can easily strip bark from trees, and if the damage is extensive enough, this can kill a tree through girdling. This occurs when the cambium and xylem, the “transport tubes” for the tree, are severed, which cuts off the leaves from the roots. The risk is worst for younger saplings, but if the damage is consistent and extensive, even the oldest tree can be dispatched through investigative chewing. Any new plantings within a field should be fenced off for protection, as should any trees showing signs of abuse. Fencing should be placed far enough from the tree to keep a horse from reaching the tree with its neck, and added distance is ideal for very young trees that need their leaves and branches protected. Impacts on grass growth - Similarly, while shade-grown grass has benefits we highlighted earlier, too much shade might result in poor grass growth or even stand loss from too little sun or rain. Be aware that some grass varieties will perform better in shade. Orchardgrass is one example – whose name derived from its ability to grow well under trees. When seeding in shaded areas, select shade tolerant grass types such as orchardgrass. Occasional thinning of trees and removal of falling leaves and pine needles will aid in grass growth. Certain trees may also negatively impact local soil chemistry with respect to suitability for grass to grow. If your grass is looking thin in areas around trees, it could be due to the soil chemistry, and could be worth testing to determine if a nutrient deficiency or acidification event is preventing grass growth. Soil compaction - Finally, if only a single or a couple of trees are the source of shade for the horses, soil compaction is a risk if horses crowd the base of the tree(s), and will result not only in killing the grass, but impacting the health of the tree as well. Providing multiple shelter options can help reduce stress on these areas. Keep in mind that, as a general rule of thumb, horses are more likely to negatively impact, or be negatively impacted by, trees under scenarios in which a horse is bored, such as when grass or hay grazing is not available, or when horses are kept in isolation from each other. Horses and trees co-located in smaller confined areas such as a dry lot also present a greater risk and should typically be avoided. Even under optimal conditions, however, fallen leaves and seeds can be ingested accidentally as part of regular grazing. In conclusion, trees provide a wide array of benefits to a pasture, as a potentially free source of shade, beneficial wildlife habitat, and water filtration. However, care must be taken to ensure that such trees are not toxic or hazardous to the horses that live amongst them, and that the trees are in turn protected from curious nibbling. Hopefully, with the above resources, you will be better able to plan and manage your pastures through the use of existing trees, or with addition of planted trees, to keep your horses and the environment happy and healthy.